A family photograph of Mildred McGann Johnston, mother of Charles Johnston Jr. The family lived on Perrysville Ave. on the North Side and in 1942 Charles Johnston Jr., enlisted in the U.S Army. He was killed in New Guinea on April 10, 1944. ARLINGTON, Va. – Billy Mall was 10 when the letters stopped. He would eagerly read the letters chronicling his cousin Chuck’s stories of military life and his visions of soon barreling down on the Japanese. Often, there would be an Army Air Corps patch or two. But one day in April 1944, instead of a letter, there was a tersely worded telegram addressed to Billy’s aunt Mildred: Tech. Sgt. Charles L. Johnston Jr. of Pittsburgh, her son, was missing in action. MIA meant there was hope, and that was something Mildred McGann Johnston never lost. “She believed until her dying day that he was going to come walking back through the door,” her nephew remembers. It would be 70 years before he would learn the truth about what happened to his cousin and boyhood hero. This is Tech. Sgt. Charles Johnston’s story. Chuck was one of the older cousins, but he didn’t leave out the little ones when the extended family got together on Pittsburgh’s North Side. He always included Billy when the older boys would joke around or play touch football in his parents’ yard on Perrysville Avenue. “He was the one guy who paid attention to me,” said Mr. Mall, now 82. Chuck liked going on fishing trips to Canada with his father and brother Robert, seven years younger, and was known in high school as “one of Perry’s super basketball men,” according to his yearbook. The same yearbook said Chuck wanted to become a coach or a steamfitter like his father, who had worked at Pittsburgh’s Sauer Inc., at the time a small plumbing contractor. He took up the trade for a year, but World War II was raging and soon there was no question where he was headed: the military. Everyone in the family was involved in the war effort in one way or another — buying war bonds, collecting scrap metal and selling stamps. But Chuck wanted to do more. It was Nov. 7, 1942, exactly 11 months after the Japanese attack on Pearl Harbor. Chuck had just turned 19. It was time to enlist, joining the Army Air Forces. His first stop was Wendover Field, Utah, where a medical officer declared him fit for duty. Soon he shipped off for training at Fort Meade, Md. ; Miami Beach; Sioux Falls, S.D. ; Las Vegas; Salt Lake City; Hamilton, Calif. and Fairfield, Calif., War Department records show. 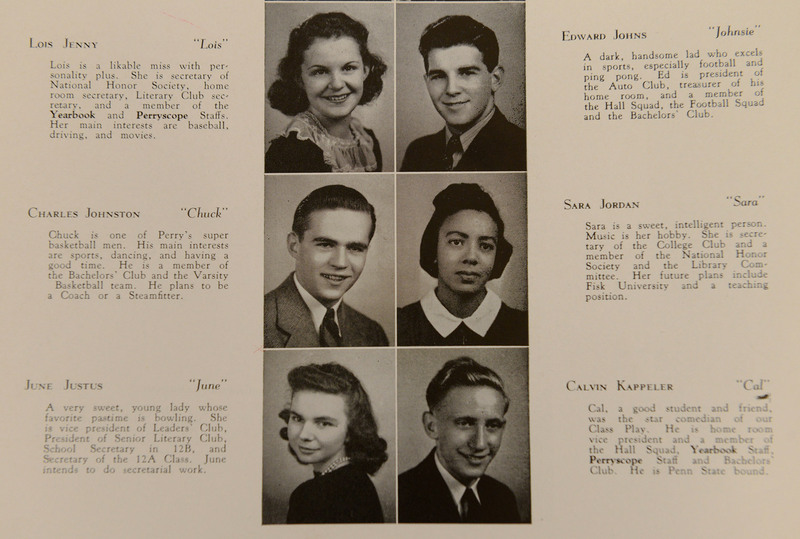 Charles Johnston was a 1942 graduate of Perry High School on the North Side. In the yearbook he wrote that he planned on being a coach or steamfitter. His father, Charles L. Johnston Sr., was a steamfitter. Back in Pittsburgh, Bill kept up a correspondence with his older cousin in the halting penmanship he was learning at Dehaven School in the Glenshaw area of Shaler, where writing to soldiers was a class project. “It was to support the war effort, but I was the only one who got a response,” Mr. Mall said during a recent interview in Arlington, Va.
“He was a single guy and GIs like to get mail — any mail. So I wrote to him and I asked him all kinds of questions, and he took the time to tell me about gunnery school. … He was kind of my hero,” he said. “He sent me his Air Force patches and I was eating that stuff up because I always wanted to be a fighter pilot,” said Mr. Mall, who is now retired after a 33-year military career in the U.S. Air Force. Mr. 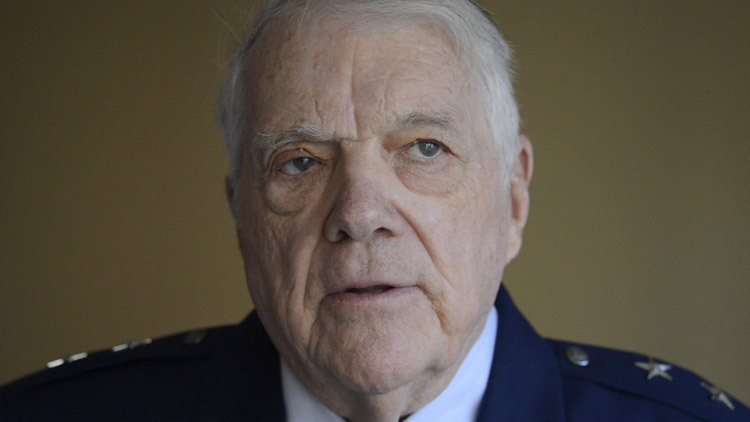 Mall, who eventually became a two-star general in the Air Force, flew 156 combat missions, commanded the Air Force Special Forces during the invasion of Grenada and retired from the Pentagon as Air Force director of personnel plans. Mr. Mall remembers when the the letters from his cousin suddenly stopped. 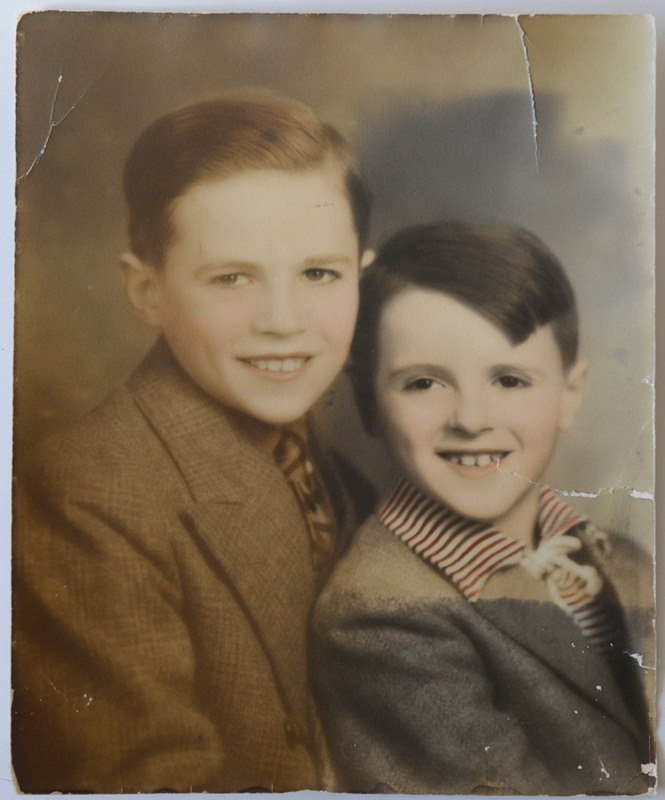 A family photo of Charles Johnston, left, with his brother Robert, seven years younger. As a child, Bill Mall exchanged letters with his cousin Charles Johnston, who had enlisted in the Army Air Forces during World War II and went to gunnery school. 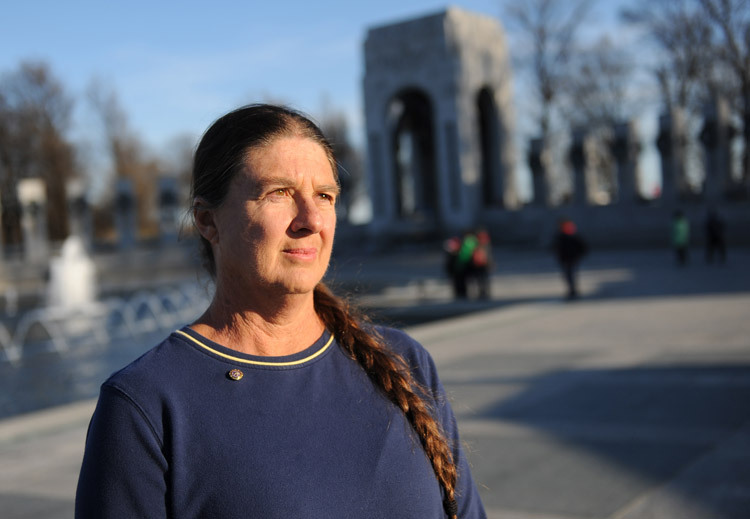 Terri Gelbart, niece of Charles Johnston, at the World War II Memorial in Washington, D.C., on March 18. She grew up knowing that her father had a brother, but the family didn't talk much about him. "It was a sad, sore part of their lives." He remembers hearing about the telegram that came for his aunt, but he didn’t know what it meant and was afraid. “My mother was the one who told me he was missing but I didn’t understand. I had several uncles in the service. They were in all kinds of combat — in the Army, the Navy, the Marines — but they were all very fortunate. They all came back and this guy didn’t,” said Mr. Mall, who now lives in Fullerton, Calif.
His sister, Carol Schake, three years younger, remembers little of Chuck, but their Aunt Mildred is harder to forget. 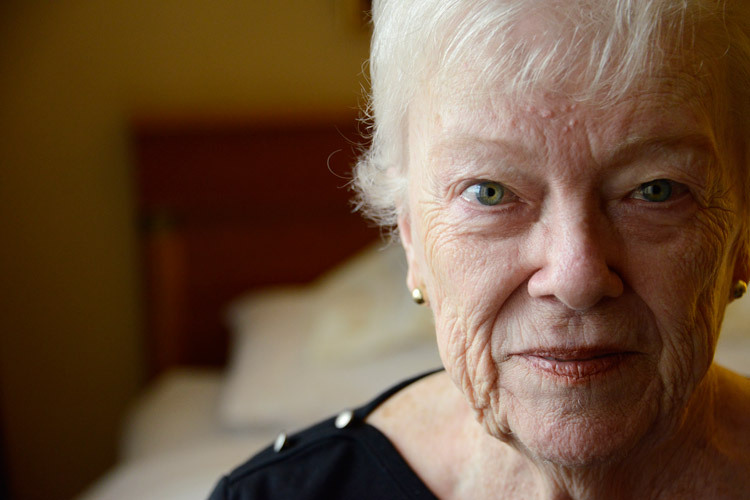 Carol Schake of South Carolina at her hotel room in Arlington, Va., on March 3, a day after the burial ceremony for her older cousin, Charles Johnston, at Arlington National Cemetery. “I visited her often and I know she did always hope Chuck would be found,” said Mrs. Schake, now 79, of South Carolina. Mrs. Johnston wasn’t dissuaded even in 1946 when a War Department memo said her son was presumed dead. By the time her grandchildren came along, she rarely spoke of Chuck. She was widowed 15 years after Chuck disappeared and the burden of grieving for a lost child had become hers alone. “It was a very sad spot in her heart and she didn’t want to burden us with it. My grandmother was always very sad about it,” said Terri Gelbart of San Diego. 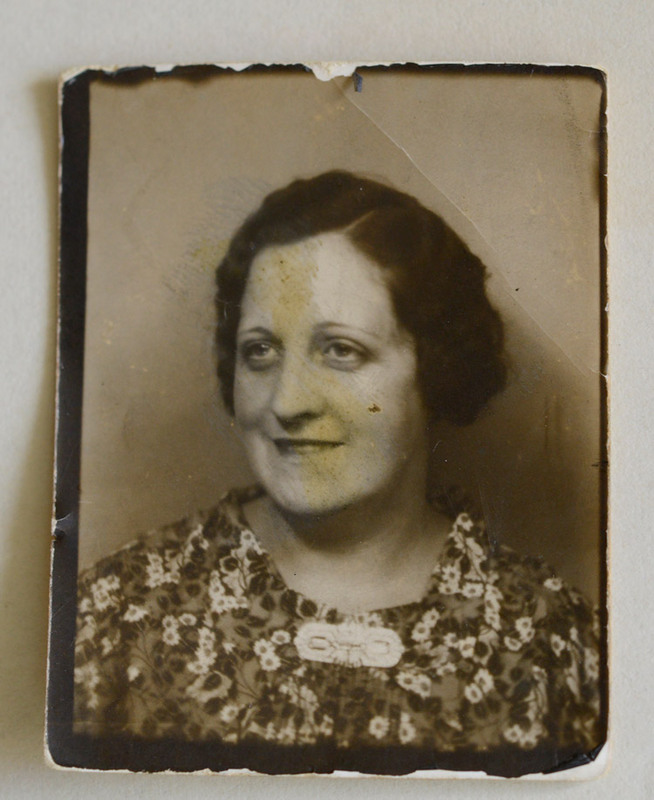 Now 60, Mrs. Gelbart was only 4 when her grandfather, Charles L. Johnston Sr., died. She was told that Chuck’s death devastated her grandfather, but to her he was a fun-loving man who laughed at her silly jokes and who would buy her anything she wanted. For both grandparents, “I think the focus became on us grandchildren just to ease the pain of losing their first son,” Mrs. Gelbart said. Mrs. Johnston died in 1985, without ever knowing her son’s fate. That always bothered her granddaughter who, over the years, visited military websites and online veterans’ forums to ask if anyone knew anything of her Uncle Chuck. Meanwhile, 100 miles north of San Diego in Fullerton, Calif., a distant cousin she’d never heard of got a phone call from the military. Over the decades, the many branches of the McGann family — Mildred had 10 siblings — grew apart and spread across the country. Chuck’s name had become such a distant memory that when Gen. Mall’s phone rang in 2011, it took him a minute to figure out who this Charles L. Johnston Jr. was that the Army was calling about.